NOTICE to Pup Tent CCDBs: As you know at the Supreme Convention in St. Louis it was decided that Pup Tent audits no longer need to be sent to Supreme Headquarters. These audits only need to be kept by the Pup Tent and the Grand CCDB. 1500 - 1700 and 1900 - 2100. Location: 169 Riviera Rd, Pasadena, MD 21122. Marine Corps League Service 1930. 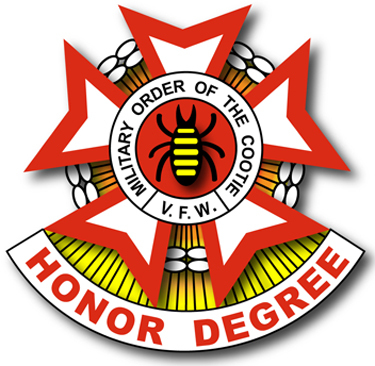 Military Order of the Cootie/VFW Service 2000. Mass and Christian Burial Friday, April 5, 2019. 1100: St. Jane Frances Church, 8499 Virginia Ave, Pasadena, MD 21122. 1200: Interment with Military Honors in Glen Haven Memorial Park, 7215 Ritchie Hwy, Glen Burnie, MD 21061. LISTEN COOTIES, SEAM SQUIRRILs and CCDBs in the Fertile Hunting grounds of Maryland. HOSPITAL WORK: Report your hospital work to the Grand Hospital Chairperson. The Grand is doing great work at the hospitals. We need to complete our Hospital Reports. Questions and concerns to the Hospital Chairperson at seeckhout@lotcs-md.org. April 12-14, 2019: Red & White Weekend: Friday, April 12, 2019: Meet & Greet and Birthday Celebration for Grand President Mildred Spence & Auxiliary Member Shelia Justice. Saturday, April 13, 2019: Grand of Maryland CofA (1200). Red & White Extravaganza (1800). All events will take place at: Wicomico County Memorial VFW Post 10159, 821 W Main St, Salisbury, MD 21801. Events hosted by Sho-Crabbers Pup Tent 27. See Extravaganza Flyer below for ticket and hotel information (hotel reservations before March 11, 2019). May 17-19, 2019: Military Order of the Cootie, Grand Pup Tent of Maryland & Auxiliary Grand Scratch. Clarion Hotel, 5400 Holiday Dr., Frederick, MD 21703 (301) 694-7500. Contact the hotel directly for individual room reservations and mention "Military Order of the Cootie" Rate. Cut-off date is April 17, 2019.